583. The integuments or coverings. The outer covering is the testa, the inner the tegmen, as in the ovule. The latter is thin and delicate, often indistinguishable from the testa. 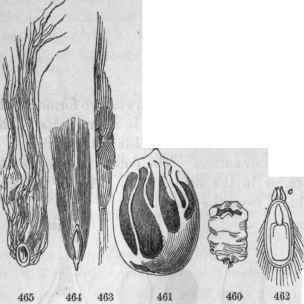 Seed of Water-Lily (Nympbaea), enlarged section; alb., albumen; a, the embryo contained in the embryo-sac; 8, secundine or tegmen; p, primine or testa; r, raphe, ar, aril; m, mi-cropyle; r, funiculus. 463. Seed of Bean. 464, Same, one cotyledon with the leafy embryo. 461, Seed of Apple. 462, One cotyledon showing the raphe and embryo. 460, Fruit of Mirabi-lis; embryo coiled into a ring. 454, Onion; embryo coiled. 455, Convolvulus; leafy embryo folded. 456, Embryo of Cuscuta. 457, Typha. 45i Ranunculus. 459, Hop. 584. The testa is either membranous (papery), coriaceous (leathery), crustaceous (horny), bony, woody, or fleshy. Its surface is generally smooth, etc. (118, a). 585. 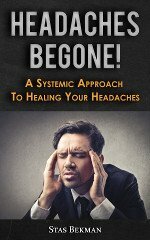 The coma must not be confounded with the pappus, which is a modification of the calyx, appended to the pericarp, and not to the seed, as in the ache-nia of the thistle, dandelion, and other Compositae. Its intention in the economy of the plant cannot be mistaken, serving like the pappus to secure the dispersion of the seed, while incidently as it were, in the ease of the cotton-seed, it furnishes clothing and employment to a large portion of the human race. 586. The aril is an occasional appendage, partially or wholly investing the seed. It originates after fertilization, at or near the hilum, where the seed is attached to its stalk (funiculus). Fine examples are seen in the gashed covering of the nutmeg, called mace, and in the scarlet coat of the seed of staff-tree. In the seed of Polygala, etc., it is but a small scale, entire or 2-cleft, called caruncle. 587. The position of the seed in the pericarp is, like that of the ovule, erect, ascending, pendulous, etc. (§ 534). Likewise in respect to its inversions, it is ortho-tropous, anatropous, amphitropous, and campylotropous (§ 536), terms already defined. The anatropous is by-far the most common condition. 588. The hilum is the scar or mark left in the testa of the seed by its separation from the funiculus. It is commonly called the eye, as in the bean. In ortho-tropous and campylotropous seeds, the hilum corresponds with the chalaza (§535). In other conditions it does not, and the raphe (§537) extends between the two points, as in the ovules. 589. The seed kernel may consist of two parts, the embryo and albumen, or of the embryo only. In the former case the seeds are albuminous, in the latter, exalbuminous, a distinction of great importance in systematic botany. 590. The albumen is a starchy or farinaceous substance accompanying the embryo and serving as its first nourishment in germination. Its qualities are wholesome and nutritious, even in poisonous plants. Its quantity when compared with the embryo varies in every possible degree; being excessive (Ranunculaceae), or about equal (Vio-laceae), or scanty (Convolvulaceae), or none at all (Leguminosae). In texture it is mealy in wheat, mucilaginous in mallows, oily in Ricinus, horny in coffee, ruminated in nutmeg and pawpaw, ivory-like in the ivory-palm (Phytolephas), fibrous in cocoa-nut, where it is also hollow, enclosing the milk. 591. The embryo is an organized body, the rudiment of the future plant, consisting of root (radicle), stem-bud (plumule), and leaves (cotyledons). But these parts are sometimes quite undistinguishable until germination, as in the Orchis tribe. 592. The radicle is the descending part of the embryo, almost always directed towards the micropyle, the true axis of the seed. 593. The plumule is the rudimentary ascending axis, the terminal bud, located at the base of, or between of the young plant. The nutritive matter deposited in the seed for the early sustenance of the germinating embryo is found more abundant in the cotyledons in proportion as there is less of it in the albumen,- often wholly in the albumen (wheat), again all absorbed in the bulky cotyledons (squash). 460, Aril of Euonymus. 461, Aril of Nutmeg (mace). 462, Seed of Polygala, embryo, caruncle, c, (too small.) 468, Seed of Catalpa. 464, Seed of Willow. 465, Seed of Cotton. 595. The number of the cotyledons is variable, and upon this circumstance is founded the most important subdivision of the Phaeno-gamia, or Flowering-plants. 596. The monocotyledons are plants bearing seeds with one cotyledon, or if two are present, one is minute or abortive. Such plants are also called Endogens, because their stems grow by internal accretions (§ 716). Such are the grasses, the palms, Liliaceae, whose leaves are mostly constructed with parallel veins. 597. The dicotyledons are plants bearing seeds with two cotyledons. These are also called Exogens, because their stems grow by external accretions, including the Bean tribe, Melon tribe, all our forest trees, etc. These are also distinguished at a glance by the structure of their leaves, which are net-veined (§ 258). 598. More than two cotyledons. The Pine and Fir have seeds with several cotyledons, while the dodder is almost the only known example of an embryo with no cotyledon. 466, Dicotyledonous (Bean). 467, Monocotyledonous (Wheat). 46S, Polycotyledonous (Pine). 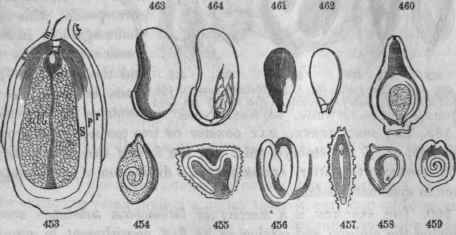 469, Acotyledonous (zoospore of one of the Confervae), (r, r, r, radicle; p, p, p, plumule; c, c, c, cotyledon; a, albumen). 599. The position of the embryo, whether with or without albumen, is singularly varied and interesting to study. It may be straight, as in cat-tail, violet, or curved in various degrees (moon-seed, pink), or coiled (hop), or rolled (spice-bush), or bent angularly (buckwheat), or folded (Cruciferae). In the last case two modes arc to be specially noticed. 1, Incumbent, when the cotyledons fold over so as to bring the back of one against the radicle (shepherd's purse); 2, accumbent, when the edges touch the radicle (Arabis). 600. The leafy nature of the cotyledons is often distinctly manifest in their form and structure, as in Convolvulus (455). A few plants, as the onion, orange, Coniferae, occasionally have two or even several embryos in a seed, while all the Cryptogamia or flowerless plants have no embryo at all, nor even seeds, but are reproduced from spores, bodies analogous to the pollen grains of flowering plants (469).